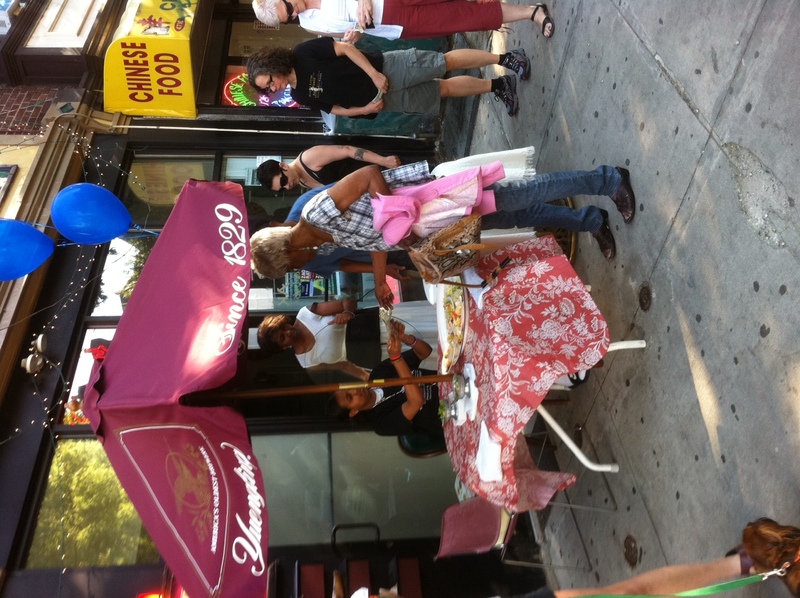 Last year, the University City District kicked off a series of “Baltimore Avenue Dollar Strolls” in which local merchants along Baltimore Avenue in West Philadelphia sampled their wares for the low, low price of one dollar. They had a few strolls during the warmer months but I never had the chance to check them out. This year, I vowed to take part in at least one stroll. 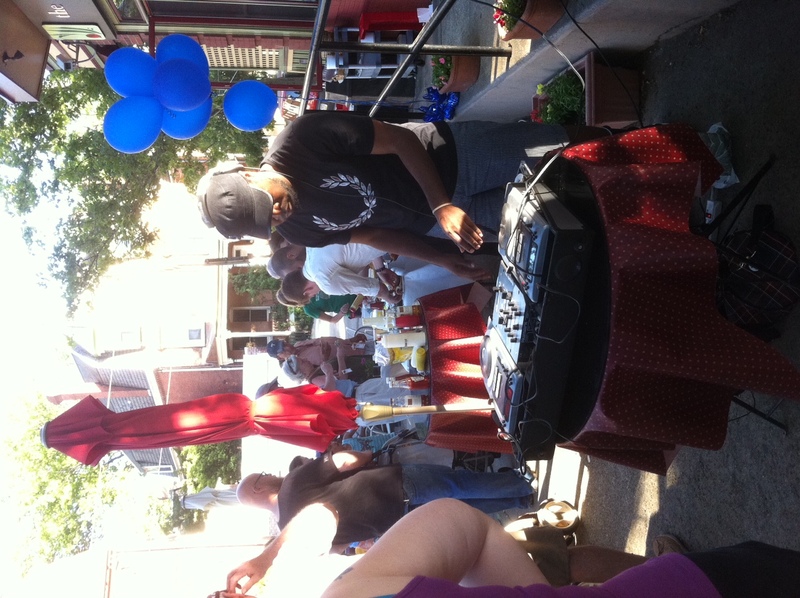 Last Thursday was the first event of the 2011 season. My husband was working late and I figured I’d take the opportunity to hang out with my family. I grew up in West Philadelphia, just off 47th and Baltimore and the area holds a special place in my heart. I hopped on the 34 trolley after work and took the quick ride to 47th street. As I rode west on Baltimore Avenue, I noted the changes that have taken place since I moved out of the area seven years ago (I lived in West Philly for a year after college.) The Wurst House is now The Best House, there has been an influx of Indian restaurants, the old flower shop is now the wildly popular Green Line Cafe and West Coast Video is no longer…and that’s just a start. At the same time, Fu-Wah is still standing (although they’ve adjusted to the changing clientele–you can buy organic tampons there!,) the Ethiopian bar-restaurants are as popular as ever and good old Davis Pharmacy is still kicking. As I walked down 47th street, the sun glistened on the greenery around me and I was reminded, for a moment, how much I love West Philadelphia. I relaxed on my parents’ porch swing as I waited for my father to come home. When he arrived, we headed down the the first Thursday afternoon Clark Park Farmers Market of the season. 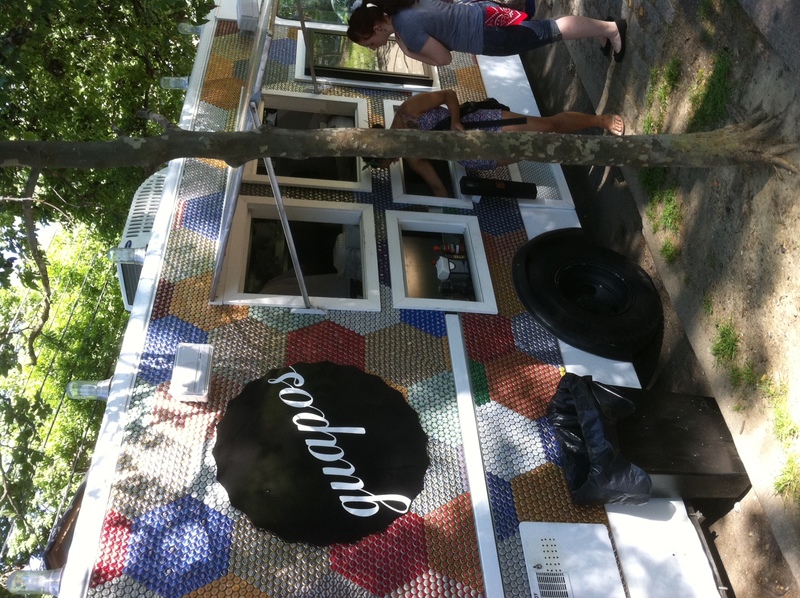 I had heard that Guapos Tacos would be making an appearance at the market and, after picking up a juicy container of strawberries, I beelined towards the truck. There was no line! In the nature of blogging research, I just had to try some. The truck is adorable, of course, decorated with bottle caps. 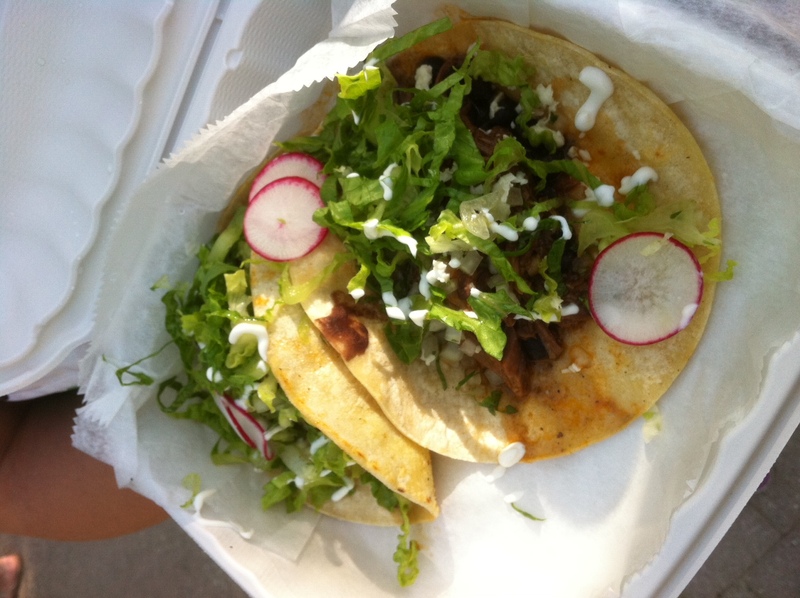 I checked out the menu and decided on the chipotle short rib tacos. I’m a big fan of short ribs. 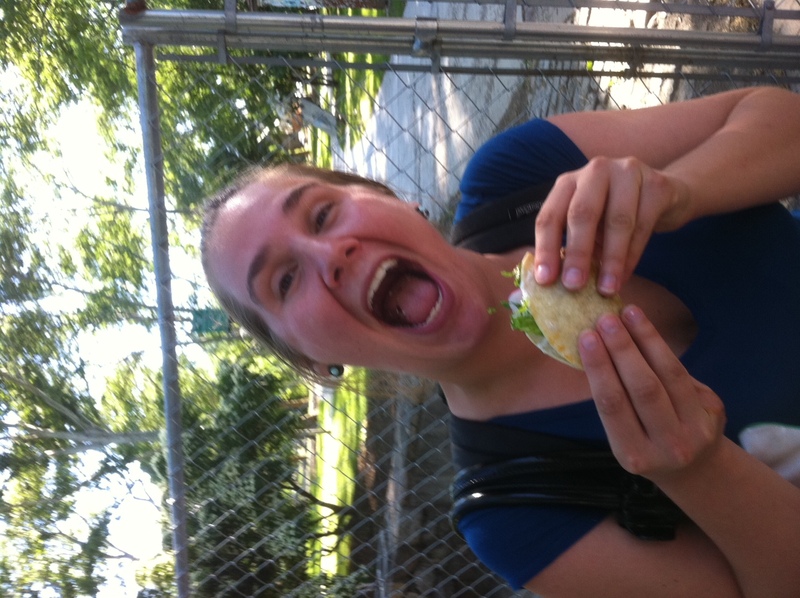 After a short wait and a conversation with the owner of an adorable (but not as adorable as mine) bulldog, out came our tacos! Because I knew I’d be eating for the next few hours, my sister and I split the order, eating one taco each. She liked hers! The verdict? The meat was chewy and plentiful with a nice amount of crunchy, fresh veggies but the chipotle flavor was nowhere to be found. Nowhere. 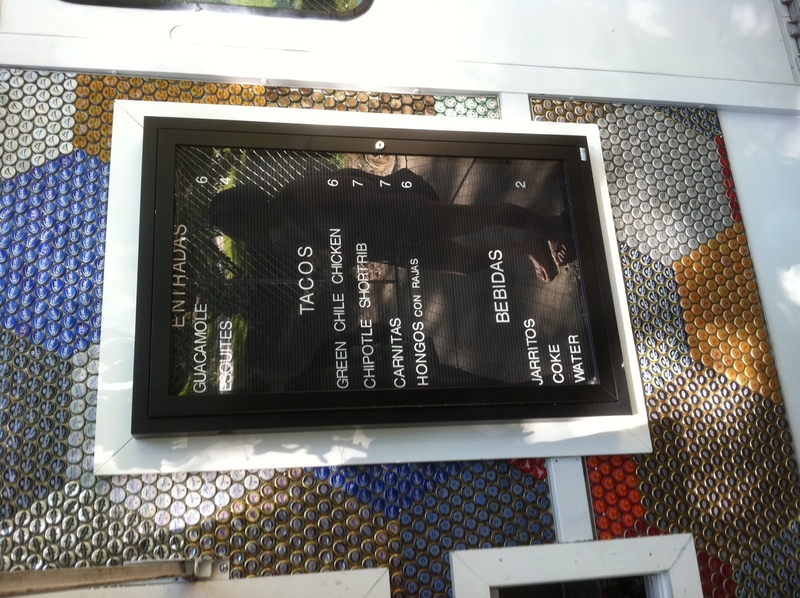 In fact, I had to double check the photo I took of the menu to make sure that I had not mistakenly remembered that chipotle flavor. In the end, I prefer Honest Tom’s. After finishing our tacos, we headed west on Baltimore Avenue and stopped into the pet shop to cuddle with their kittens and pick up a few treats for my dog. I refrained from the pink camouflage sweatshirt and the bejeweled “Bad to the Bone” shirt and stuck with some basic treats for my dog and a couple toys for my best friend’s kitties–cat toys were two for a dollar! From there, we crossed the street to Desi Village where they had samosas, vegetable pakora, Mango lassis, milk balls (a dessert I love but don’t know the real name. Always call them milk balls) and another dessert. Growing up, my family ate a lot of Indian food. We ate at the Tandoor buffet when the occasion called for a night out and still frequent the restaurant. The owners love my family and dote over my father every time they see him. We opted for a samosa and mango lassi, my sister’s fave. As she enjoyed her samosa (she was heading to work in a bit,) I grabbed a quick photo. 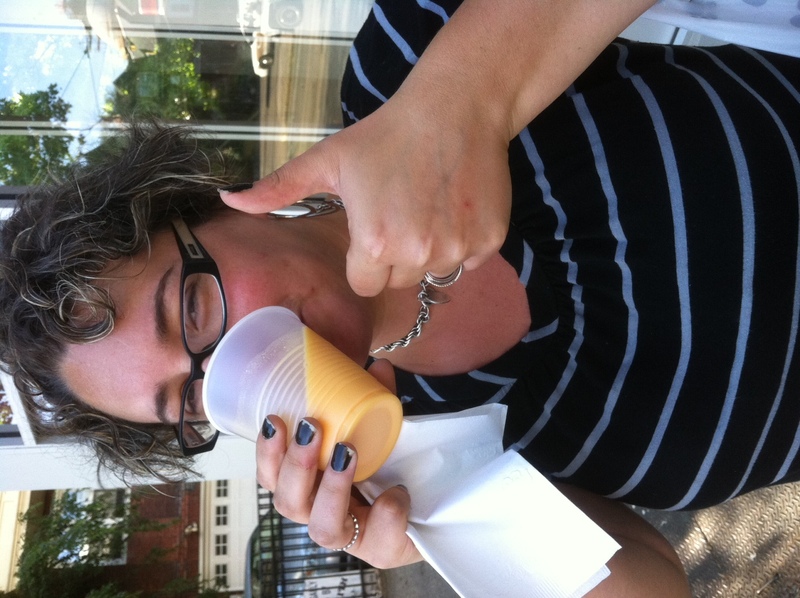 Meanwhile, I snuck sips of her mango lassi. My family loves this drink but I’ve never jumped on the bandwagon. Well, apparently I’m late to the party because mango lassis are the bomb! Damn. If I had any foresight, I would have touched up my nail polish. Sigh. From Desi Village, we continued west. I left my sister at 47th street and met my father outside Dahlak where he was chowing down on an injera lentil wrap–that little sneak! We weren’t supposed to get food until my mom got there. Well, if he was going to do it, so would I. I hopped in the Vientiane line. 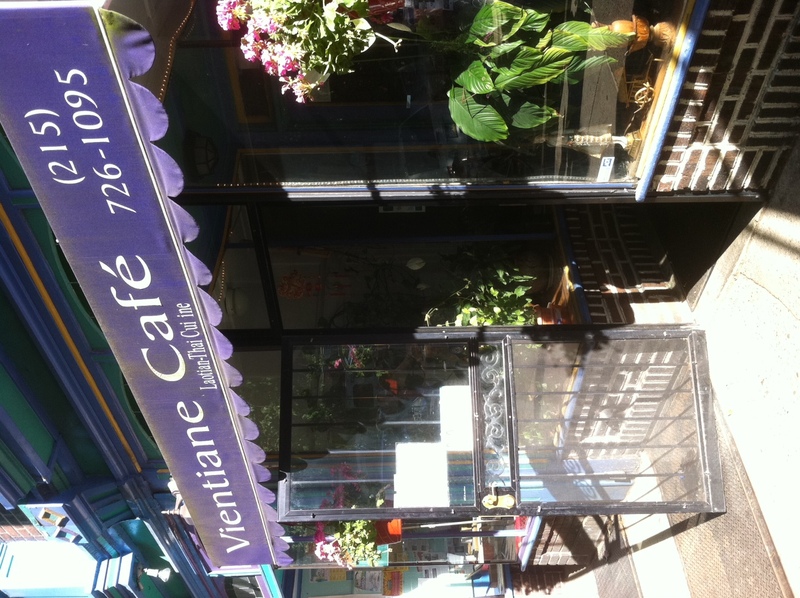 Vientiane was serving up chicken or tofu skewers and vegetarian summer rolls. The line was reasonable and I’m glad I grabbed their food early because by the time we looped back down, the line was almost a block long. I got a chicken skewer and veggie summer roll. They were both excellent. 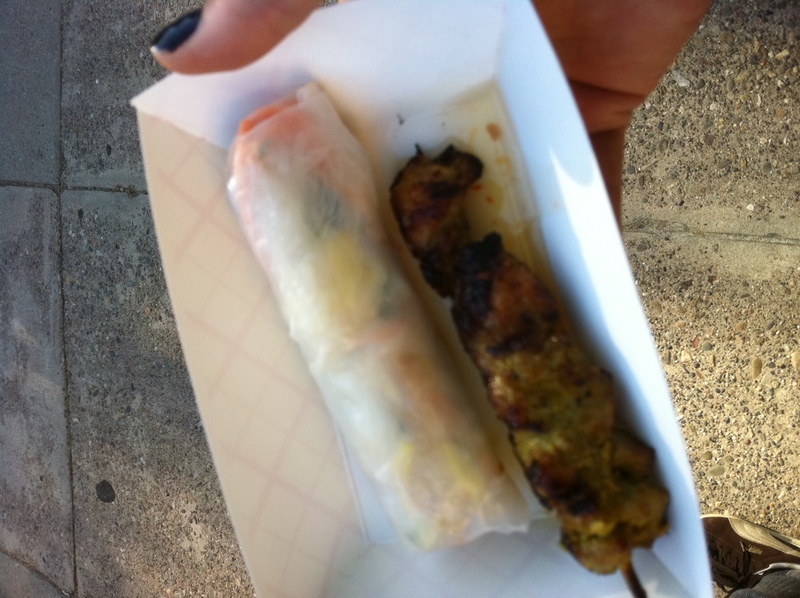 The skewer was tender and flavorful while the summer roll was perfectly crunchy and seasonal. 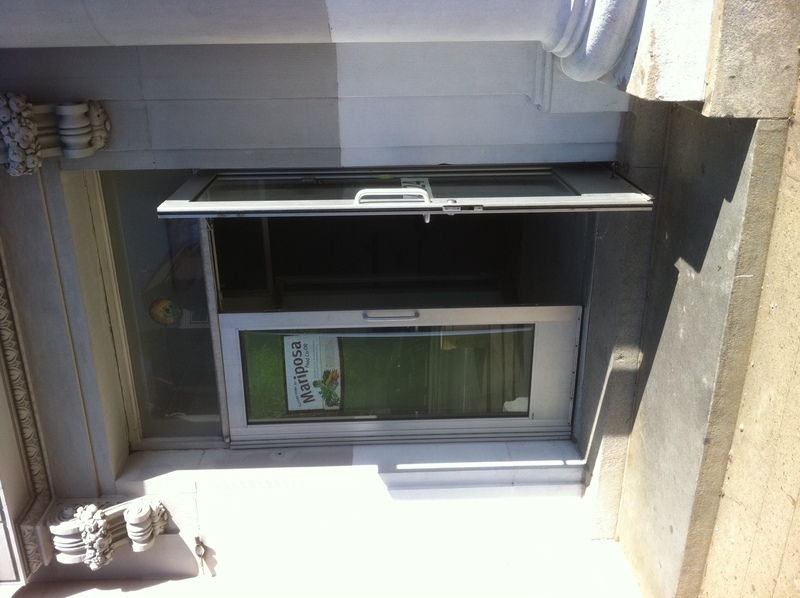 As we munched, we continued westbound and passed the current Mariposa Co-op storefront. Then we passed the new location. I’m so excited for them! Mariposa has grown HUGELY in the past few years and I look forward to seeing their continued growth. Our next intended stop was Dock Street but they didn’t have a beer special and it was too hard to snag down a server so we headed to Elena’s Soul Cafe. Elena’s is the type of place you didn’t go to back when I lived in the neighborhood. Luckily, the atmosphere has changed a bit without losing its charm. This was the first of three dollar beers we indulged in that evening. The Pabst was icy cold, which is the only way to enjoy mediocre beer (more on that later.) My father and his friend, Arthur, chatted by the window and asked me to snap a photo of them in front of the artwork. 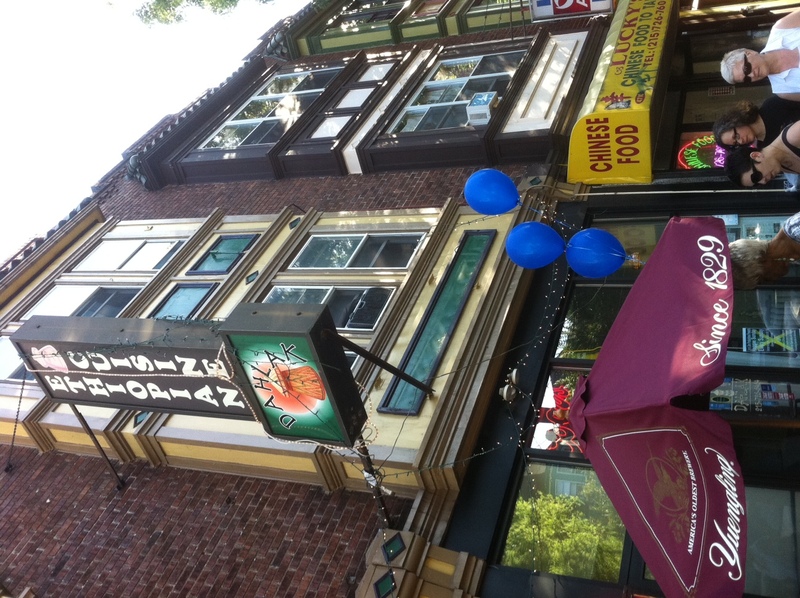 We threw back the beers and strolled out of Elena’s. By then, Baltimore Avenue was certainly hopping. Next up, The Gold Standard, who gets points for having a DJ spinning. They had a large spread including sliders, chicken wings and something falafel-esque. Chicken wings were one for a dollar. C’mon man, one for a dollar? We could have gotten three for a dollar at Lucky’s Chinese store down the street and I’m sure they would have been just as good. I believe they had a few desserts as well. …until I bit into it. It was a black bean burger! 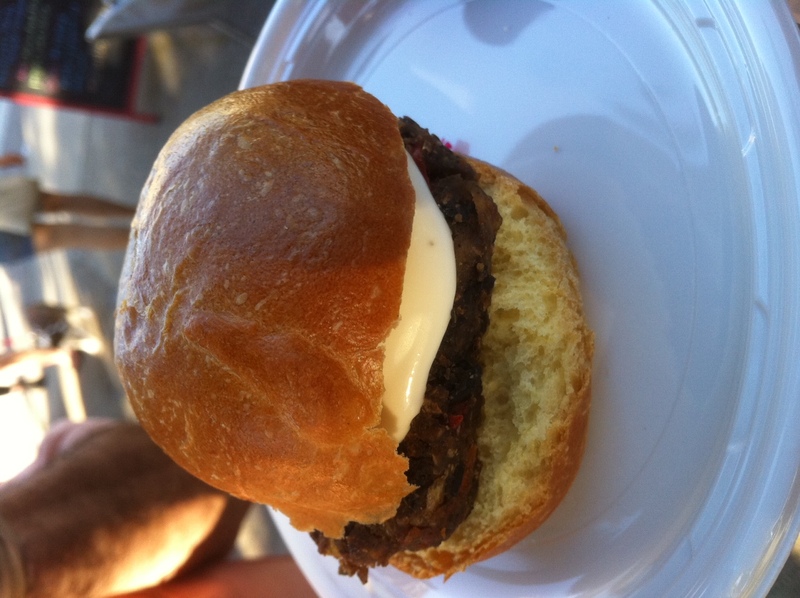 Don’t get me wrong, I enjoy vegetarian meals as much as the next former vegetarian, but I was really, really pumped for a juicy little slider. Oh wells. We ran into some neighbors as well as Rep. Jim Roebuck. What a stand-up guy he is. 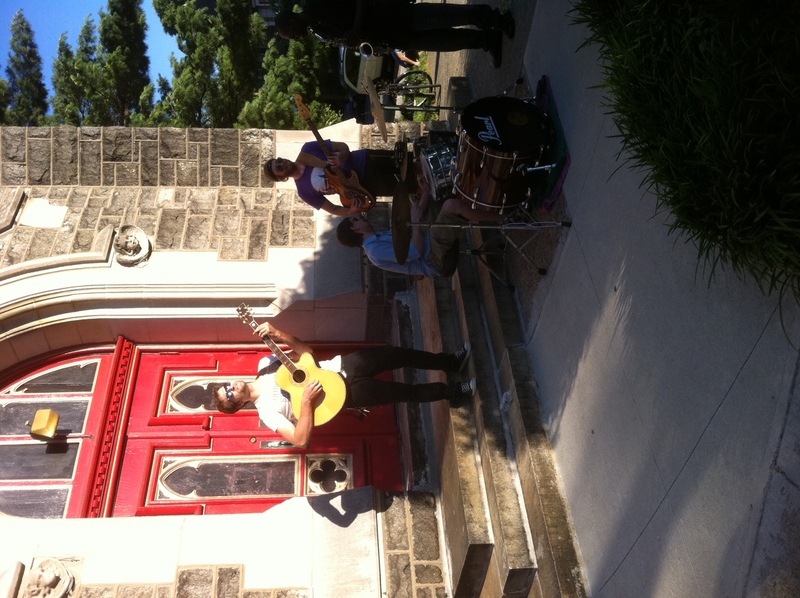 On our continued migration east on Baltimore, we passed Calvary Church with a band playing on its steps. It was about this moment that I began to muse about the possibility of Passyunk Avenue hosting its own dollar stroll event. 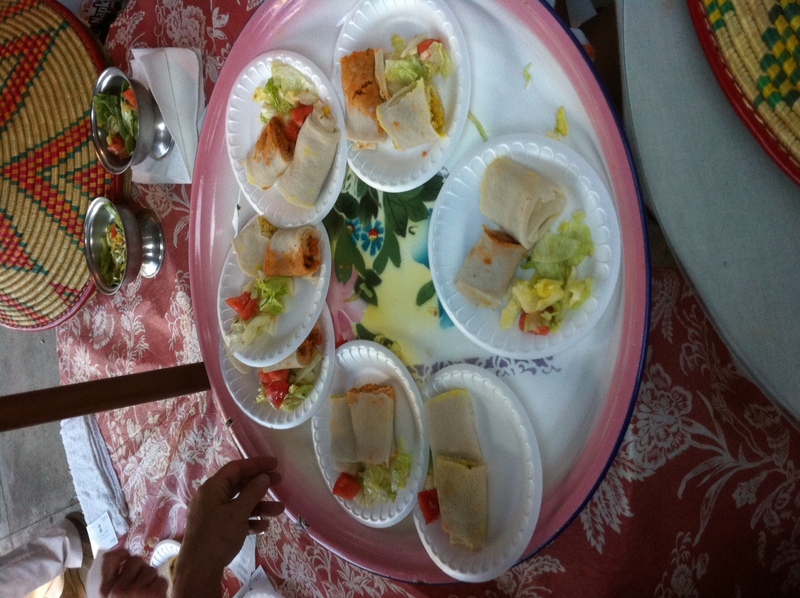 Dahlak was dishing up some tasty red lentil injera wraps. I’ve spent countless hours in Dahlak, a neighborhood institution, but it’s been a while since I’ve eaten traditional Ethiopian food. I promised myself it wouldn’t be so long next time. The doughy injera is just so tasty with just a bit of a spongy tang on your tongue. After finishing up wraps, Arthur noticed a sign in front of Abby’s Dessert Lounge advertising dollar beers. Unlike Elena’s, Abby’s is still the type of place I wouldn’t tend to frequent. 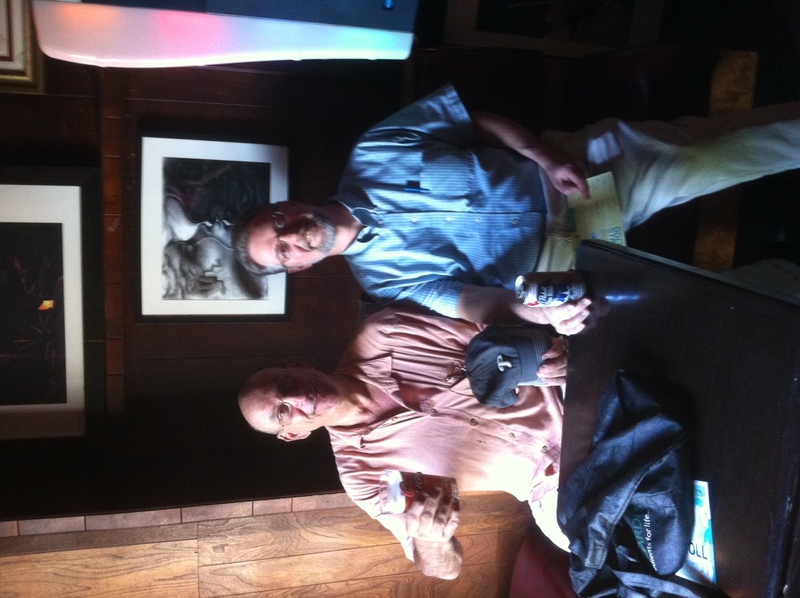 In fact, amidst my early 20s bar frequency between 46th and 48th and Baltimore, I had never set foot inside the place. Despite my trepidation, we made our way into the dimly lit bar and were greeted by a pleasant bartender and plenty of friendly folks, including a gentleman who gave me his seat so I could sit next to my mother. We enjoyed our frosty Buds (despite the weird trick the bartender did with the napkin that was, I believe, her attempt at keeping the mouths of the bottle clean) and made our way. As we ambled pleasantly towards 46th street, we noticed the increase in crowds which brought long, long lines. 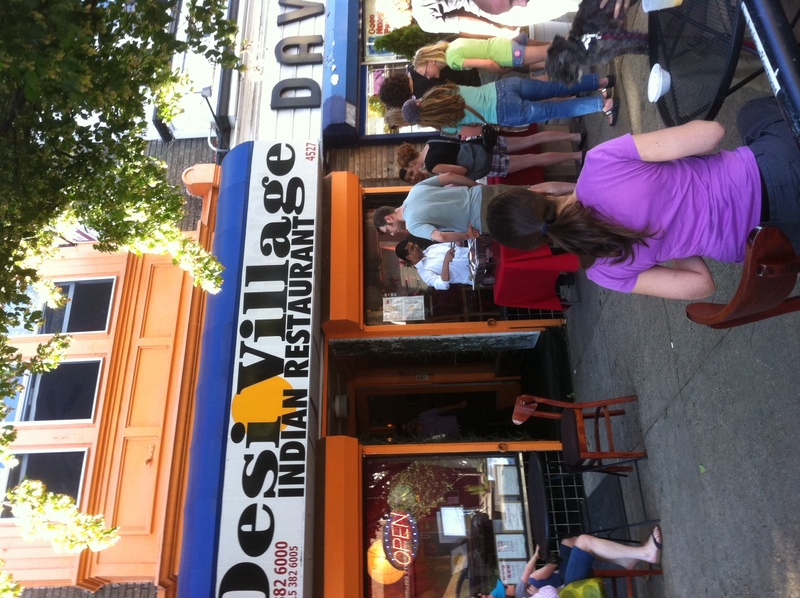 I wanted to bring my parents back to Desi Village but that line was down the block and around the corner. At that point, we figured it wouldn’t hurt to have another beer, being as how we were approaching Queen of Sheba and all. When I was finally able to push through the throngs of people to get inside, the helpful bartender told me that they had run out of the cold PBR and had put a new case on ice. 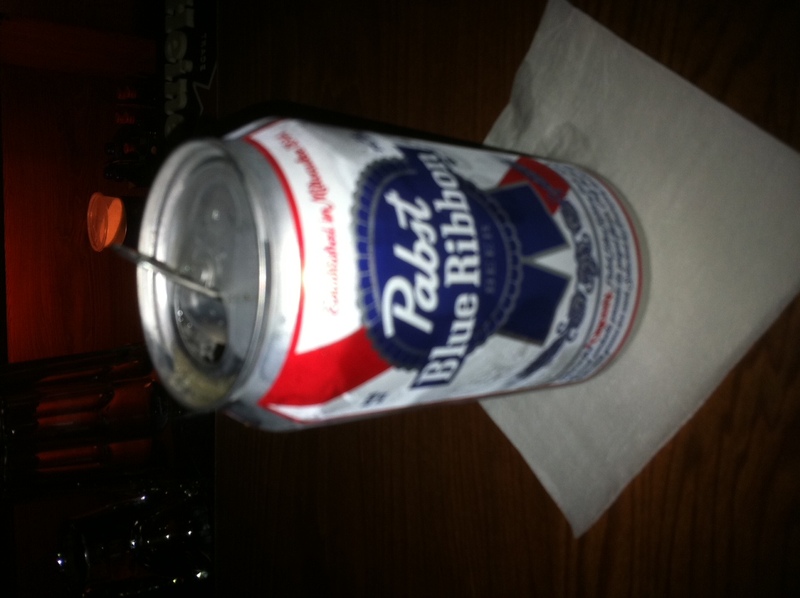 Warm PBR, albeit a dollar, just didn’t sit well for me. I dragged Arthur out of there, promising him we could return later. 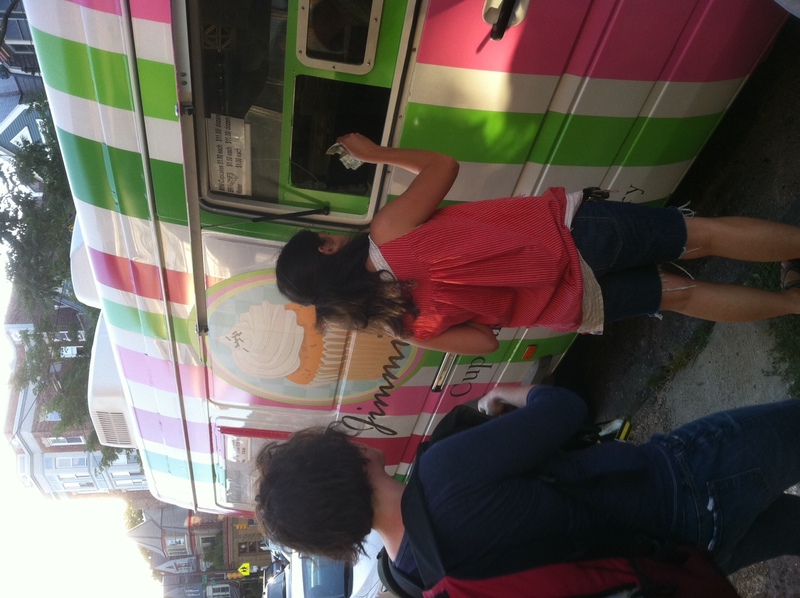 We passed by this cute little cupcake truck that I’d never heard of before. People were chowing down. When we passed a neighbor enjoying the Bassett’s ice cream being scooped by Milk and Honey, she offered up this crucial tip: “go to the line inside. It is much shorter.” Thank you, Janet. That tip was a godsend! We bypassed the looong outdoor line and waited indoors for just a few minutes before my mom, dad and Arthur were happily slurping their mint chocolate chip. 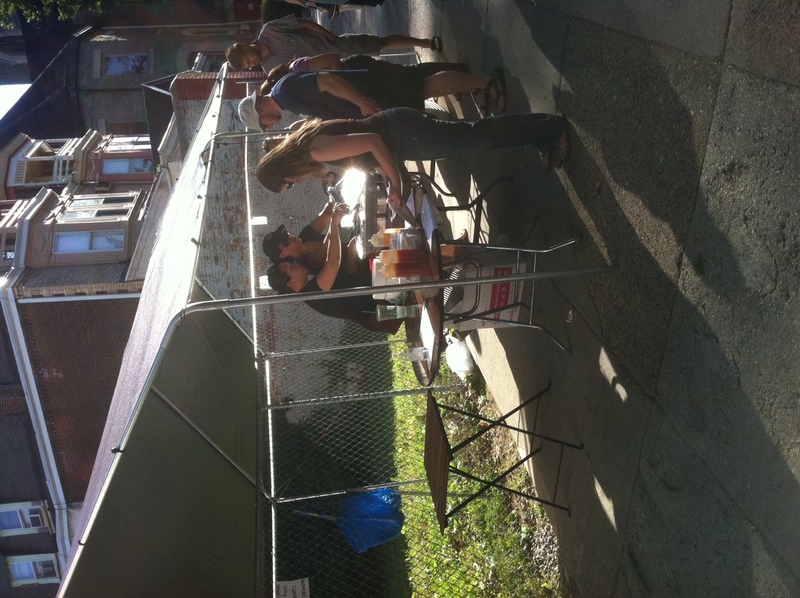 As we made our way down the block, I noticed another tent set up adjacent to the Milk and Honey ice cream scoops. My parents were chatting and I heard someone from the tent saying here she comes. I followed her gaze and caught sight of a woman crossing Baltimore Avenue with a full chafing dish in her arms. I quickly gathered my companions and hopped in line, not knowing what we were waiting for. We were in luck–Milk and Honey’s new prepared soul food store, Roost, was serving up chicken on a biscuit. In many ways, I consider that my best score of the night. 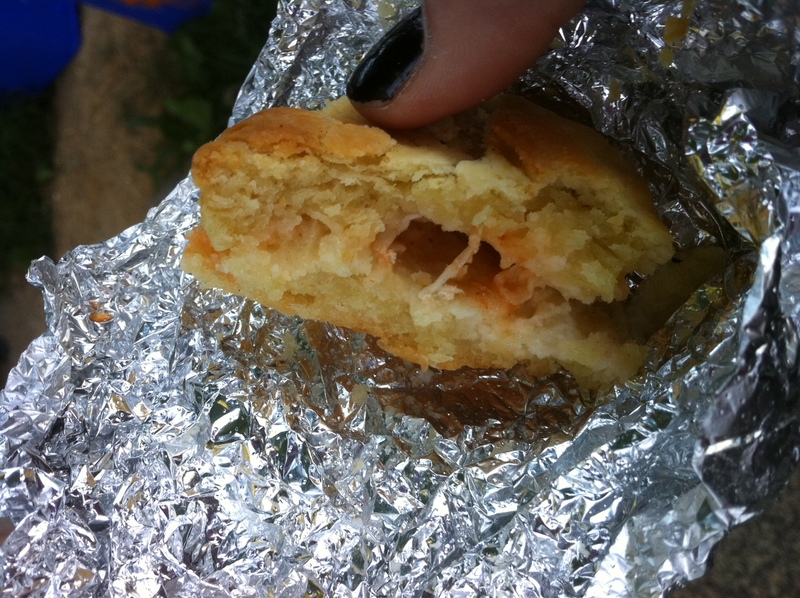 The biscuit was buttery and flaky without being too dry and the chicken was a carrier to the nottoohot hot sauce that I added. I was ready to wrap up at 45th street, but my parents (mom) just had to go to Green Line. 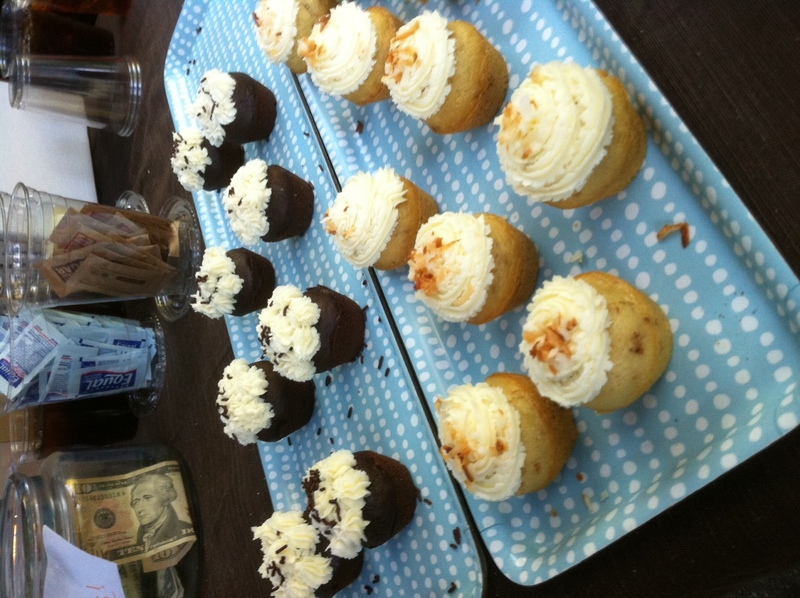 We walked the empty two blocks to the coffee shop and mom and dad enjoyed iced coffees and these cute little cupcakes. I hear rumor they were vegan but missed the flavor. We wrapped up at Green Line and my mother wanted to make one final stop at Desi Chaat House because she loves their samosas. As we approached the monstrous line, mom says “this line’s not too long.” We waited in line for about 10 minutes without moving until I decided to take action. 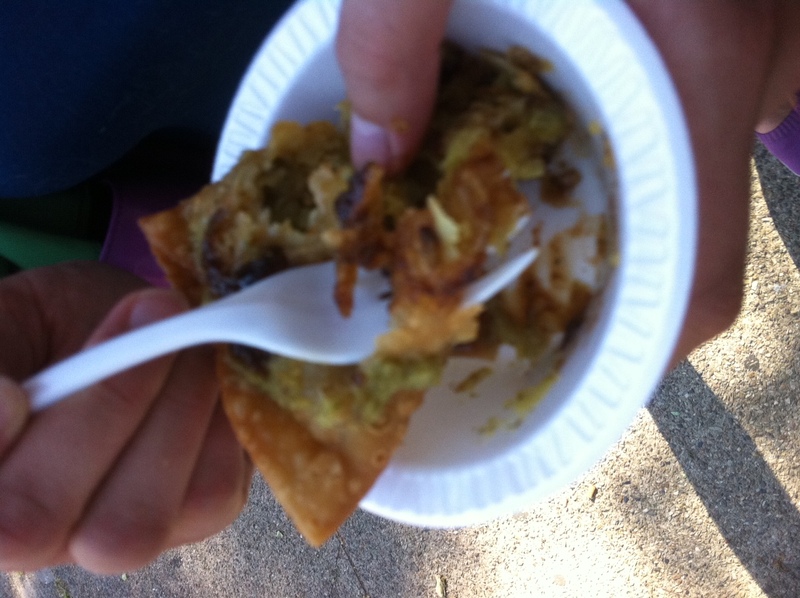 I convinced the group that we’d be waiting until tomorrow if we stayed in line for a simple dollar samosa. As we walked away, my mother says “do you know how much they cost normally? $1.50.” I was floored. 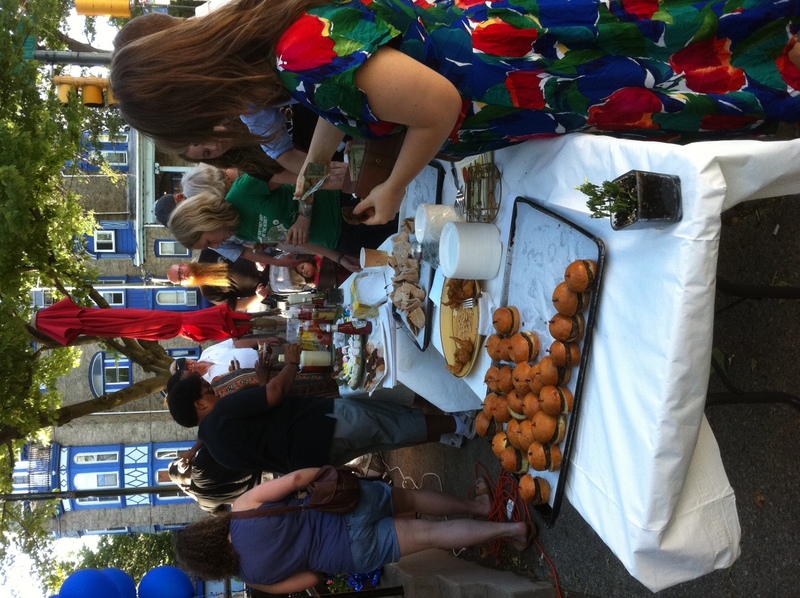 The Baltimore Avenue Stroll is a beautiful way to bring together the community while exposing people to restaurants or cuisines they might not otherwise try. I loved strolling down the avenue that I called home for 20+ years while envisioning the same stroll on my new “Avenue.” It just reminds me how much I love this city–the diversity of people, neighborhoods and cuisines is beyond comparison. Sounds like you had a good time at the Dollar Stroll. I just recently heard about Jimmie’s Cupcakes. Hopefully sometime I’ll get to try them out. But I don’t think they’ll be anywhere convenient in the near future. Jen, did you see they were at the Night Market too? This was a detailed and pictorial account of the Dollar Stroll. Where did you learn to write so well? What a great idea! I wish they’d do something like that in Fishtown. It sounds like a great time.